First, our profound pranams to Shri Mataji for having blessed us with such a joyful experience after the Paramchaitanya Puja. 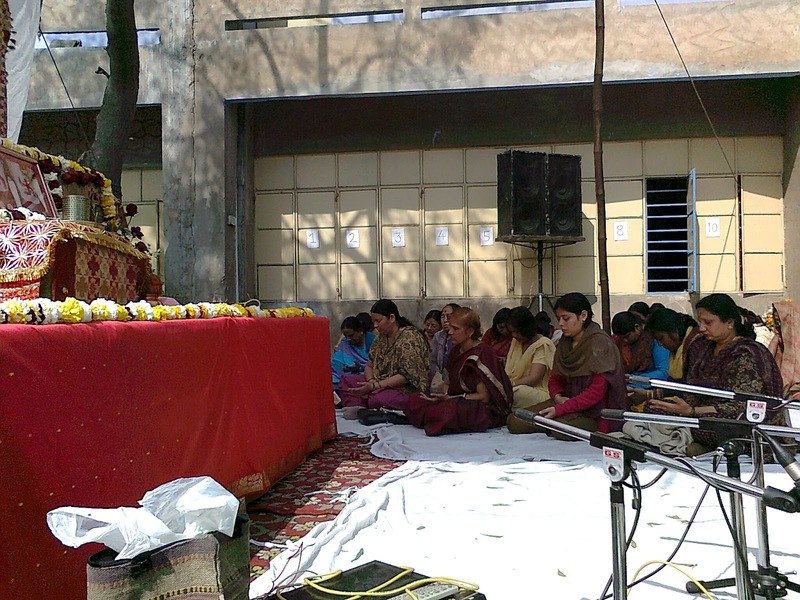 Around 6 sahaja yogies from Bahrain visited Nirmal Dham (ND) during 22-23 Feb 2012, for the paramchaitanya puja. Little, we would have realized what were in store for us. 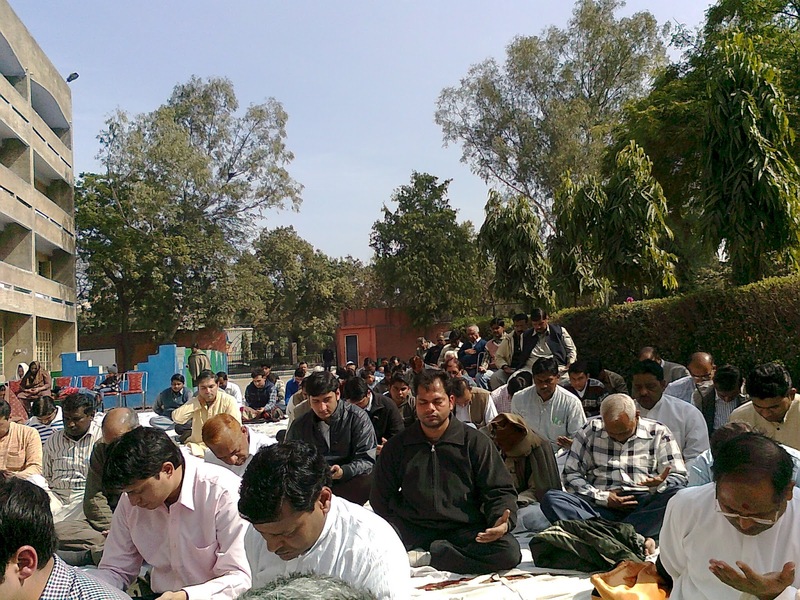 On 23rd Feb 2012, after the puja and lunch, lazily we were strolling on the beautiful lawn in front of Shri Mataji's Maha Samadhi. One of my known contact from chennai collective introduced us to a group of sahaja yogies from Delhi who shared with us, how to meditate effortlesstly? The paramchaitanya had worked out so spontaneously that in the next 1 hour or so we were taken to a sahaja yogi's house. Of course, the travel took more than 2 hours by cab, 2 buses and a few hundred meters walk. Our first reaction after hearing that it might take more than 2 hours to reach the spot was to drop out from this and continue to stay at ND and enjoy the music program. But Shri Mataji had plans otherwise, probably the best. We were joking to ourselves as to how to come back from south delhi to ND as none of us had any clue about Delhi. The flight was at 5:40AM the next morning. So we had little time at our disposal. It would be worth to mention here that 2 of our sahaj yogis had plans to do some shopping in Gurgaon, but having heard that we are proceeding for this meditation, instantly they dropped their idea of shopping and joined us. Around 8pm we all managed to reach south delhi. After served with some hot samoosa and sweet we settled down for the meditation. "Your meditation has to be effortless, like the nature exposes itself to the rays of Sun effortlessly, so that the rays can fall on every being and the Nature nourishes itself effortlesstly"
To me personally, it was like undoing 9 years of load in few hours. All along I was told and taught, self taught meditation through various mantras, chanting etc. at times I felt little mechanical about what I was doing. The real connection and feel was missing on and off. Here, the key mantra or the Maha Mantra taught was "Shri Mataji". It was so powerful, that within few minutes, the thoughts disappeared, the background music being played slowly dissolved in my ears and was in a deep state of meditation. We felt Shri Mataji's presence on swadistan when we were asked to concentrate there by asking a question. By the time we finished our dinner and another round of short meditation, it was 30 minutes past midnight. Reluctantly, we returned to our hotel room with heart jumping with joy with the newly learned technique. I've tried this method back home in Bahrain and the moment I feel the chillness and on my sahastrara the vibrations were flowing effortlessly, my heart was jumping with joy like a little child who found its Mother. Thank you for sharing this wonderful knowledge and the experience you all had given us. Our humble request would be to work out a schedule so that we can invite your team to Bahrain and share this knowledge directly with our collective. As your affirmation repeated often during the meditation, we want our collective to experience this directly!!!! Thank you once again, will be troubling you often with few questions here and there. It was a wonderful day to attend the Paramchaitanya Puja along with other SY from Bahrain collective. This was the very first visit to Nirmal Dham for most of us. With the utmost blessings of Shri Mataji, every moment of our visit was so divine and collective. During our entire trip there were no other thoughts / talks other than sahaj. After the Puja on 23rd Feb 2012, we relaxed on the lawn sharing our divine experiences about this puja. While discussing we met one yogi brother from India, he casually asked us about our evening program. Without any hesitation we immediately told him that we are free and also ready to attend if any such workshop / seminar in the evening. He then said will inform if any such activity there. So we then went to have our lunch, while having our lunch hecalled us over phone and asked whether we could attend the Workshop in the evening. We immediately agreed to it without even knowing the distance, location of the workshop. Then few Delhi SY brothers took us to the workshop place which was very far from Nirmal Dham. Almost we travelled 2 hours by two buses to reach that place. Also we walked few meters throughout this travel. We were all so much tired of this tedious bus travel and felt that we could have stayed in Nirmal Dham listening to the musical evening. This all was Shri Mataji’s divine play testing our perseverance right from the beginning. But above all we were all very much sure that some divine force is alone taking us from Nirmal Dham. We reached around 7.30 PM and right from that minute we could see such a smiling and warmth hospitality from every member of that place. We felt as if we are in our home and also know these Delhi SY brothers for many years. Our Nabhi was taken care immediately by hot samosa and tea / juice. We then went to another room where nice pictures of shri mataji was kept. Without much time we were all ready to experience the meditation session conducted by At Your Lotus Feet Mother Team yogis brothers and sisters. Our divine experience cannot be narrated by mere words. Each one of us were spell bound. What an inner silence and peace. Amazing. Cool vibrations on our palms & Sahasrara. I Remember in one of the speech Shri Mataji asked a normal man after the speech in English, whether he could understand and why he was so silent. Though that man could not understand the English speech of mother, yet he simply answered ‘Maa.. jab masth uvey tho kya kaheney’. We were in that state. Nothing to say, just wished to remain in that Nirvichar state throughout. For me, I personally felt a splendid inner silence which I have not achieved all these days. Also after the meditation session when all of us opened our eyes, very first thought for me was where am I sitting and which is this place. I was totally in a Nirvichar sthithi and it was so wonderful moment in my life. By the time we finished our meditation session it was around 10.40 PM. What more divine blessings and moments we could ask for. We then asked many questions and clarified many of our sahaj doubts with them. Just as an enlightening and eye opener sahaj moments for me. Since the day I returned from Delhi, I could feel a complete transformation within me and I am now able to enjoy the cool vibrations without much efforts. We, the Bahrain Collective will be really blessed by Shri Mataji, if your team could make a visit and enlighten our collective also. I bow down at the Golden feet of our mother and thank deep from my heart for blessing all our Bahrain SY with such a blissful and divinely evening. My Love and thanks to each and every SY brother who were with us during that evening. 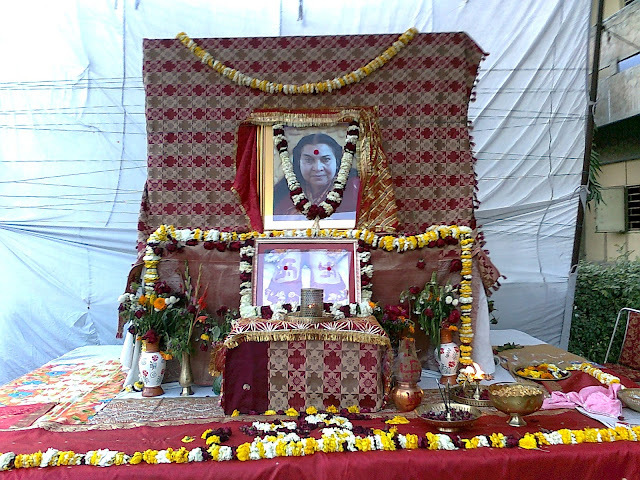 By the grace of Param Pujya Shri Mataji, a Sahaja Yoga meditation workshop was held at East Delhi at Green Fields Public School, Dilshad Garden's compound on 12th February 2012. It was attended by about 275 sahaja yogis from East Delhi, West Delhi, Central Delhi, North Delhi, South Delhi, Rewari - Haryana, Bagpat, Moradabad, Ghaziabad, Gr. Noida and Noida.